The holiday is over and it is time for the professional riders to start their serious training for the 2017 season. After the team building activities at the first team meetings in November, the month of December is traditionally the time for the first real training camps where the first drafts of the season schedules are made and just a few weeks later, the cycling season is in full swing at the Tour Down Under. During the next few weeks, CyclingQuotes prepares you for the coming season in a series of analyses where we take a detailed look at each of the 18 WorldTour teams and what to expect during the next 12 months. 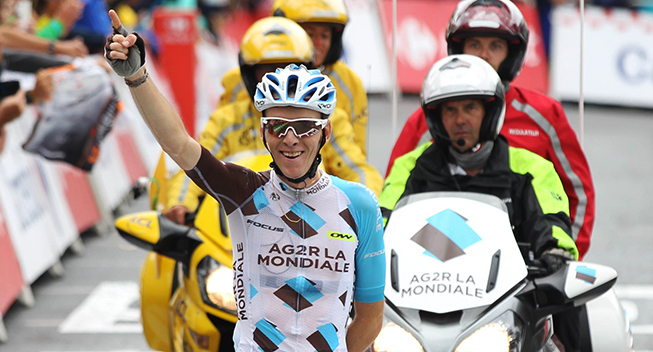 Below we take a look at Ag2r-La Mondiale. With no less than 11 new signings, Ag2r have been one of the most active teams on the transfer market and they have done very well in strengthening their team significantly. The team have picked up some of the best riders from the IAM team and in general, they are clearly among the big winners of the transfer season. The transfer strategy has clearly had two goals. First of all, Ag2r have always been a climbing team with a focus on GC in stage races. With Romain Bardet’s emergence as a potential grand tour winner, the emphasis is likely to increase in the next few years. Hence, it has been a big aim to sign some strong climbers who can accompany Bardet in the mountains. Secondly, the team plan to broaden their horizons. A few years ago, they signed Damien Gaudin, Johan Vansummeren and Sebastien Turgot to have a bigger impact in the cobbled classics. That strategy has failed and those three riders will all leave the team in 2017. Instead, they have brought in a new crop of classics riders and for the first time ever, they will be a candidate for the top spots in the northern classics. For the first goal, the signings of Mathias Frank and Alexandre Geniez stand out. The former had a good first year at IAM leader but the last two years have been difficult. However, the Swiss proved in 2014 that he has the ability to stay with the very best in the mountains. In this year’s Vuelta, he proved how good he can be when he is under less pressure and he could flourish in his role as luxury domestique – just like he did when he worked for Tejay van Garderen at BMC. Frank can be a very good lieutenant for the Bardet. Geniez is one of the most inconsistent riders in the peloton but he has shown flashes of his potential. After all, he has won two stages at the Vuelta, most recently in 2016, and he has been in the top 10 at the Giro. He has proved that he can do two grand tours in a row and has made it clear that he wants another shot at the Giro. As he teams up with Pozzovivo for the Giro, he will give the team another shot at a top 10 in Italy and another solid domestique for Bardet in the Tour. For the classics, the team have made a major coup. It has always been clear that Oliver Naesen is a major talent but he never hit his best form in the spring. Hence, it was relatively easy for Ag2r to attract the Belgian but during the autumn, it became clear that their signing is far better than many expected. Naesen was one of the strongest riders in August and September where he took a WorldTour classics win in Plouay and was the best in the queen stage of the Eneco Tour which allowed him to finish second overall. Next year he is set for a big breakthrough in the biggest races and at Ag2r, he will have the freedom to be a leader. In the Eneco Tour, it became clear that Naesen still lacks a bit of experience and so it is simply perfect that he will be joined by Stijn Vandenbergh. For years, the Belgian has been one of the strongest riders on the cobbles but he has always been a domestique at Etixx-QuickStep. Now he will have the freedom to ride for himself and even though he is unlikely to win a big classic and wasn’t really at his best in 2016, he will make sure that Ag2r will have two riders at the pointy end of the big cobbled races. Another coup is the signing of Sondre Holst Enger. The Norwegian had a difficult start to his pro career but last year he proved what he can do in the biggest races. He had a very good debut at the Tour de France and he will give Ag2r some rare firepower in the sprints. He is never going to win the big bunch sprints but his potential in the classics and reduced sprints is fantastic and he could be one of the big revelations of 2017. As the team clearly aims to have better chances in the sprints, they have also signed Rudy Barbier who is more of a real sprinter and has been one of the most consistent riders in the Coupe de France races. The team have also continued to invest in young talent. Nans Peters is one of the biggest climbing talents and will follow in the footsteps of the likes of Romain Bardet and Pierre Latour who have been picked up from the U23 ranks by the French team. Clement Chevrier has been signed from IAM and the team hope that he will finally show his true climbing potential. Benoit Cosnefroy will join the team in August and he will be another climber in their growing group of talents. While the team have had a good hand in picking their new signings, their losses aren’t too bad. Gaudin, Vansummeren and Gaudin never showed much on the cobbles and will be replaced by much better riders. The loss of Jean-Christophe Peraud is of course a big one but the veteran hasn’t been at his best since 2014. Blel Kadri has been riding very poorly since his Tour de France stage win in 2014 and won’t be missed and Maxime Daniel never showed much in the sprints. The rest of the riders are mainly domestiques that can be replaced even though it is hard to see a loyal rider like Sebastien Minard being forced into likely retirement by his long-time employer. What to expect in the classics? As said, Ag2r have always had their focus on the stage races and the classics have played a smaller role. However, the significant reinforcement during the transfer season means that they will play a much bigger role in the one-day races. Already at Milan-Sanremo, we can expect to see a change. The team has never been competitive in La Primavera but the Italian race suits Sondre Holst Enger pretty well. Of course the Norwegian is not going to win the first monument as he will be up against much faster riders. However, a podium is not out of reach for the Norwegian if he can cope with the long distance. Enger may also play a role in some of the easier races on the cobbles but for the big races, it will be up to Oliver Naesen and Stijn Vandenbergh to come away with the goods. As said, Naesen showed his true potential in the autumn of 2016 when he was one of the strongest riders in the northern races and there is no reason that he can’t win one of the big ones in the future. He is strong on short climbs and with his fast sprint, he can finish it off. He is unlikely to win a monument in 2017 but don’t be surprised if he is on the podium in one or more of the biggest one-day races. Vandenbergh will be a back-up plan and unlike Naesen who is still a bit of a wild card, the veteran is a safe bet who is always around the best. He won’t win one of the big races and even though he seems to be past his best, he may flourish in his new leadership role. When we get to the Ardennes, Alexis Vuillermoz, Jan Bakelants, Pierre Latour and Romain Bardet will take over. Amstel Gold Race will be the most difficult race for the team as none of their climbers are very fast in a sprint. Their best option may be to try to keep Naesen’s shape or line up Samuel Dumoulin who – for some reason – has never really featured in a race that suits him very well. At the same time, Bakelants has proved that he can surprise in this kind of lumpy terrain and the Dutch classic is probably the one that suits him the best. For Fleche Wallonne, the team will be riding for Alexis Vuillermoz who is one of the best for the finishes on steep walls. He has already done very well in the Belgian classic and he will be keen to bounce back after a very bad 2016 season. Pierre Latour also has a decent punch and could provide the team with a second option. Liege-Bastogne-Liege is one of Romain Bardet’s favourite races and his two successive top 10 finishes in 2014 and 2015 prove that he has what it takes to be competitive. This year he was also one of the best in Il Lombardia and so he has shown that he is a great rider for the hard one-day races. He is likely to continue his trend of preparing at the Giro del Trentino (now Tour of the Alps) and he has a very good chance to finish in the top 10 in Liege. Latour also has the potential to be a great rider for the big one-day races but it remains to be seen whether 2017 will be too early for him. In the autumn classics, the team will have numerous cards to play. Enger will be competitive in Hamburg and Plouay where Naesen will be keen to defend his title. In Canada, the team can rely on Naesen, Vuillermoz and Vuillermoz who are all suited to the hilly route in North America. Finally, Bardet must be keen to make up for his near-miss in Lombardy if he still has the form after what is likely to be a hard Tour-Vuelta double. Latour also wants to show himself in the Italian one-day race where he finished in the top 10 in 2016. What to expect in the grand tours? The GCs in the grand tours will be a big goal in 2017. The main focus will of course be the Tour de France where they will aim for another podium finish with Romain Bardet. The Frenchman has made it clear that he is ready to go for two grand tours in 2017 and that he would prefer the Giro-Tour double. As a French team, however, Ag2r were unlikely to accept those plans and it seems that it will be Tour-Vuelta combination that will form the backbone of Bardet’s schedule. Bardet has openly admitted that he is not ready to win the Tour yet so the goal must be another top 3. The course seems to suit him pretty well but there are still better climbers than him among his rivals. Like in 2016, he needs to surprise the favourites with a big attack and that won’t be easy as he will now be heavier marked. On the other hand, he has shown a steady progression and that is likely to continue in 2017. With the signing of Mathias Frank and Alexandre Geniez, he will have a stronger team at his side and he will also be able to count on the likes of Mikael Cherel, Jan Bakelants, Alexis Vuillermoz and Pierre Latour who is set to make his Tour debut, in the mountains. Bardet’s GC campaign will have full focus but the team is always actively seeking stage wins in the hard stages. This could open the door for riders like Frank, Geniez, Bakelants, Vuillermoz and Latour to add to the team’s tally with an aggressive ride. The team may also be tempted to line up Sondre Holst Enger for the sprint stages but it would probably be a better idea to use the Norwegian in one of the smaller grand tours where there are more reduced sprints. As said, Bardet won't do the Giro and so the team will be led by Domenico Pozzovivo and Geniez in Italy. Until his bad crashes in 2014 and 2015, Pozzovivo had developed into one of the most consistent riders in the peloton and a real podium candidate in the Italian grand tour. Unfortunately, he hasn’t been at his best since that horrific day at the 2015 Giro and it remains to be seen what kind of level he can reach in 2017. Geniez is a solid rider and if he can hit his best form, he is capable of a finish in the lower part of the top 10. On paper, the Giro suits Enger pretty well and the Norwegian must be keen to go for a first grand tour stage win. The team could also line up Rudy Barbier who should be able to achieve a few top 10 finishes in the sprints in his debut grand tour. Bardet is likely to go for GC in what would be his debut Vuelta but as he finds himself in untested territory, Pozzovivo is likely to act as a back-up plan. Bardet has proved that he is pretty consistent so there is no reason that he can’t be competitive in two consecutive grand tours. Frank could also line up in the race and will probably have a free role which he enjoyed very much in 2016 when he won a stage in the Spanish race. The team will have room for more goals in the Spanish race and this could open the door for sprinters like Enger and Barbier and aggressive riders like Alexis Gougead and Bakelants. Bardet has made it clear that the next step in his development as a GC rider is to go for the victory in a one-week stage race on the WorldTour. Hence, the Frenchman will have a big focus on races like Paris-Nice, Vuelta al Pais Vasco, Tour de Romandie and the Criterium du Dauphiné. Unfortunately, time trials usually play a big role in all races and so it will be difficult for Bardet to win. However, he should be even more competitive than he was in 2016. Domenico Pozzovivo has always been a regular top 10 finisher in races like Tirreno-Adriatico and Volta a Catalunya and if he can return to his best, he should be up there in both races. He will also go for a podium spot in the Tour Down Under but that race suits him less. Mathias Frank is likely to lead the team in his home races in Romandie and Switzerland and if he can reach his 2014 form, he is capable of top 5 finishes in both. Pierre Latour should also continue his progress and could get a breakthrough as a stage race rider in 2017. He must also be keen to finally achieve that overall victory in the Tour de l’Ain. Samuel Dumoulin won the Coupe de France in 2016 and after postponing his retirement plans, he seems to flourish towards the end of his career. The Frenchman should again be among the best in the French one-day races where Vuillermoz could also go for victory in the GP Plumelec. Rudy Barbier will give the team more options in the sprints in their home country. Oliver Naesen and Sondre Holst Enger will provide the team with lots of options for the many Belgian races where they have usually been pretty invisible, and both of them could win one of them. Finally, Jan Bakelants has shown that he loves to ride in Italy and he is usually very strong in the autumn. He could pick up a win in one of the late one-day races. The team is loaded with talent and they have numerous riders that are ready to surprise in 2017. We have already highlighted Oliver Naesen multiple times. As said, the Belgian was one of the best in the autumn season and now he is ready to get a big breakthrough in the big races on the cobbles. Don’t be surprised if the strong and fast Belgian is on the podium in one of the great classics. Pierre Latour already won a mountain stage in his first grand tour which was no major surprise. The Frenchman has long been regarded as one of the greatest French climbing talents and he is ready to step up his level in 2017. As he is set to play a support role for Bardet in the Tour de France, he will have to go for personal glory outside the grand tour. In 2016, he wore the leader’s jersey in the Tour de Suisse so the next logical step would be to get into the top 5 of a WorldTour stage race. He could also deliver a surprise in Liege-Bastogne-Liege and Il Lombardia. Sondre Holst Enger had a difficult start to his pro career but now he is ready to prove why he was one of the best riders on the U23 scene. In 2016, the Norwegian proved his class with a memorable win in a tough finish on a stage at the Tour of Croatia, climbed excellently at the Tour of Norway and sprinted with the best in the Tour de France. He should definitely pick up a few victories in his first year with his new team and he is ready to get his breakthrough in the classics too. With his fast sprint and solid climbing skills, he can feature at the pointy end of a wide range of races. Finally, we will point to Nans Peters. The Frenchman is a huge climbing talent who is set to be the next Ag2r climber after Bardet and Latour. This will be his first year at WorldTour level so we can’t have too big expectations but look out for him to go for victory in a mountainous race like the Tour de l’Ain.